Old Holland New Masters Acrylic Mediums are the realization of a dream held by Professor Theo de Beer, Old Holland's late owner, to develop a line of acrylic paints and mediums that would be used today by the "New Masters" of art, just as Old Holland oil paints were used by the Old Masters. Use this selection of multi-textured, matte, gloss, high-build, and pearlizing mediums and additives to add dimension and depth to your artwork. These mediums can be mixed with all New Masters Classic Acrylics colors. UV Resistant Varnishes — All New Masters varnishes increase the chemical and physical resistance of acrylic paints, and protect them from ultraviolet light, increasing the durability of the painting. New Masters varnishes are removable and have a cyclohexanol base. These varnishes contain contain a petroleum distillate. Do not dilute them or mix them with water. Acrylic Mediums — These are mediums without thickener for increasing the fluidity of the acrylic paint. Acrylic mediums dry as durable transparent, matte, or satin films. Soft Gel Mediums — These gel mediums can be mixed with New Masters Classic Acrylics and other New Masters Mediums. Soft gel mediums have a more fluid viscosity than that of the New Masters Classic Acrylics. Standard Gel Mediums — These gel mediums can be mixed with New Masters Classic Acrylics and other New Masters Mediums. Standard gel mediums have the same viscosity as that of the New Masters Classic Acrylics. High Build Gel Mediums — These gel mediums can be mixed with New Masters Classic Acrylics and other New Masters Mediums. They are ideal for impasto painting. High Build Gel Mediums are semi-opaque. Heavy Gel Mediums — These gel mediums can be mixed with New Masters Classic Acrylics and other New Masters Mediums. They have a viscosity thicker than that of the New Masters Classic Acrylics. Pearlescent Tinting Gel Medium — This is a universal pearlescent gel. For best results, add 20% acrylic paint and mix to an even paste. 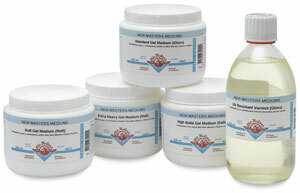 Acrylic Glazing Medium — This is an ideal medium for use with New Masters Classic Acrylics for glazing techniques. Retarder Gel Medium — This medium slows drying time and keeps colors open and clear. It has the same viscosity as that of New Masters Classic Acrylics. For best results, add no more than 10% retarder to the acrylic paint. Acrylic Silk Screen Medium — Use this paste as a universal screen printing medium. ® Old Holland is a registered trademark.® New Masters is a registered trademark.